My foray into homemade herbal shampoo began last summer. Up until that time, I just used whatever cheap shampoo I could get my hands on. Times were tight and my beloved salon shampoos were most certainly not in the budget. However, I was pretty uncomfortable with the thought of us being exposed to all of those weird sounding chemicals and knew I could do better than that. 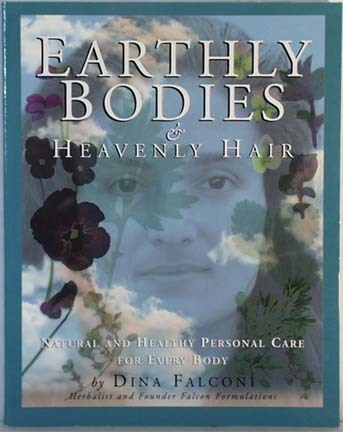 I got the framework for this shampoo from the book Earthly Bodies & Heavenly Hair by Dina Falconi. – Don’t use straight castile soap on your hair. It’s just too concentrated & strong that way. Your hair will not be happy. – Don’t use castile soap on dyed hair. It’s too alkaline and will strip hair color. (I don’t know of a specific recipe that’s safe for color treated hair, though you should be able to use shampoo bars okay.) You can apparently use castile soap on highlighted hair though and possibly henna colored hair. I don’t know anything else about those two options – but THIS POST will give you further reading to explore. – Homemade shampoo made with castile soap looks watery after you make it. However, pour a small amount into your hand and rub together and you’ll quickly see just how much lather it makes. A little bit, goes a long way. – After washing, your hair will greatly benefit from a spritzing or rinsing of diluted vinegar and water – I use a roughly half and half mixture, you may find a better ratio for your own hair. 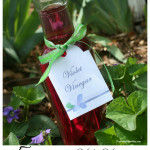 Vinegar rebalances the pH of your hair, leaving it smoother and shinier. A rinse will also help remove any excess soap residue. More on that below. – You are either going to love this shampoo or you’re not going to love it. There’s not a lot of medium opinions on this one! It’s not going to work for every hair type/length/water situation so be sure to make a small, test batch to start. From the tons of feedback I’ve gotten since I first published this recipe – the most success for this shampoo seems to happen for those with thick, coarse hair. If you try this recipe out and it’s not quite right for your hair type, or if you don’t have time to DIY your own, I highly recommend Morrocco Method haircare products as an alternative to regular store-bought shampoos and conditioners. They’re color safe, paleo friendly, vegan, and gluten free – made in small batches with pure ingredients like apple cider vinegar, aloe, essential oils and other healthy plant extracts. I’ve especially fallen in love with their Apple Cider Vinegar Shampoo and Floating Lotus Conditioner! You can learn more about their products HERE or click on the banner below. 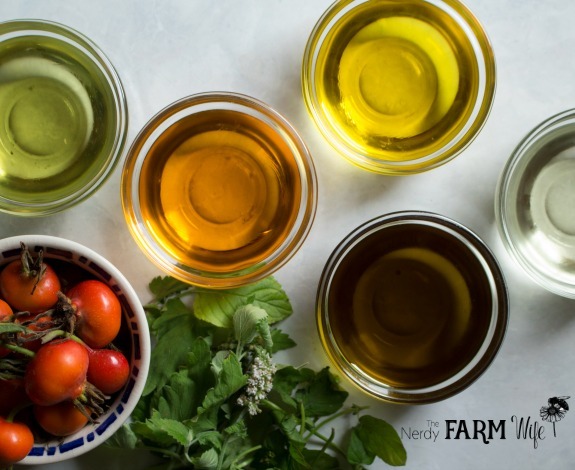 First, make your herbal infusion by placing a teaspoon, or pinch, of each type of herb you wish to use in a heat proof jar or glass, pour one cup of simmering hot water over the herbs, cap with a saucer and let steep for several hours. Strain and set aside 4 to 5 ounces. Any leftover infusion can be used in your bathwater or diluted with vinegar to use as a hair rinse. Add the castile soap, carrier oil and essential oils to the water. Gently stir until mixed. Try to avoid whipping up any bubbles, as much as possible. Pour into an easy to dispense container. You can recycle an old shampoo bottle for this. * If you don’t add a preservative, make small batches at a time and store this in your refrigerator. Shelf life will be one to two weeks, but check for spoilage before each use. I like using Leucidal Liquid SF, a nature-derived preservative, but you can find an assortment of preservatives HERE, to choose from. Shake or swirl gently before each use. If at all possible, follow with either a rinse or spritzing of vinegar and water. More on this below. Okay, so now that we know the basic recipe, let’s talk about how to customize this shampoo in order to make it your own. These can be fresh or dry or a combination of both types. Chamomile is traditionally used for light hair and rosemary for dark hair, but feel free to mix and match as you please. You can make a lovely floral shampoo, using roses, violets, lavender and other flowers with matching essential oils or create a more medicinal one with rosemary, thyme and tea tree oil. 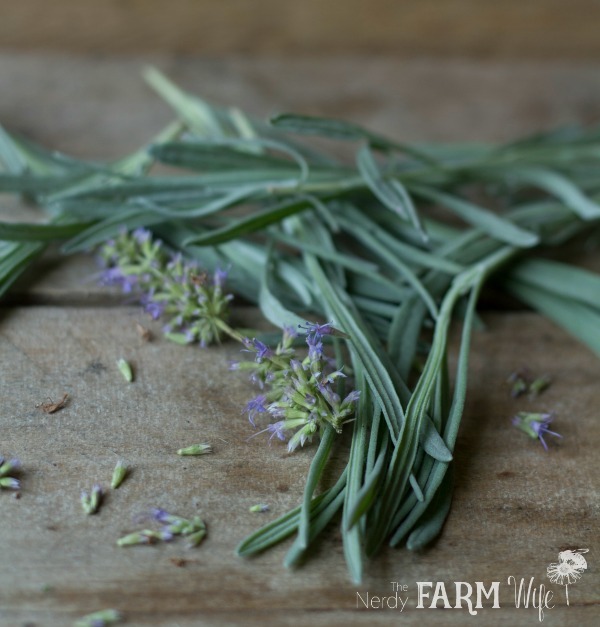 Comfrey and calendula are great for scalp conditions and rosemary is said to prevent thinning hair. Lavender may help a dry, itchy scalp. These are just a few suggestions. Peruse through the listings of available bulk herbs at Mountain Rose Herbs and see which names catch your eye. Each herb has a little link under its name that you can click for more information that will let you know what it’s useful for. You can also invest in a great herbal reference book. My favorite is Making Plant Medicine by Richo Cech. For any herbs that I don’t grow, I buy from Mountain Rose Herbs. These add a little bit of a moisturizing boost to your shampoo. My favorite to use is Tamanu Oil since it has so many great skin-healing properties and is also anti-microbial, making it ideal for those with dandruff or other scalp conditions. If you have very dry hair, you can use a bit more in your shampoo, if your hair is very oily, use less or omit completely. Make sure to shake your shampoo before each use so that the oil isn’t used up within the first washing or two. Essential Oils are added for scent and therapeutic use. Depending on the types and amount used, they can also help extend the shelf life of your shampoo. If you have dandruff or scalp conditions, tea tree oil is an excellent addition to consider. There are many other options however, including the ones listed below. Be especially careful if you are pregnant, nursing or on any medications before using essential oils. I buy virtually all of my essential oils through Mountain Rose Herbs. The vinegar helps smooth your hair, restore pH and when used as a rinse – remove soap residue. 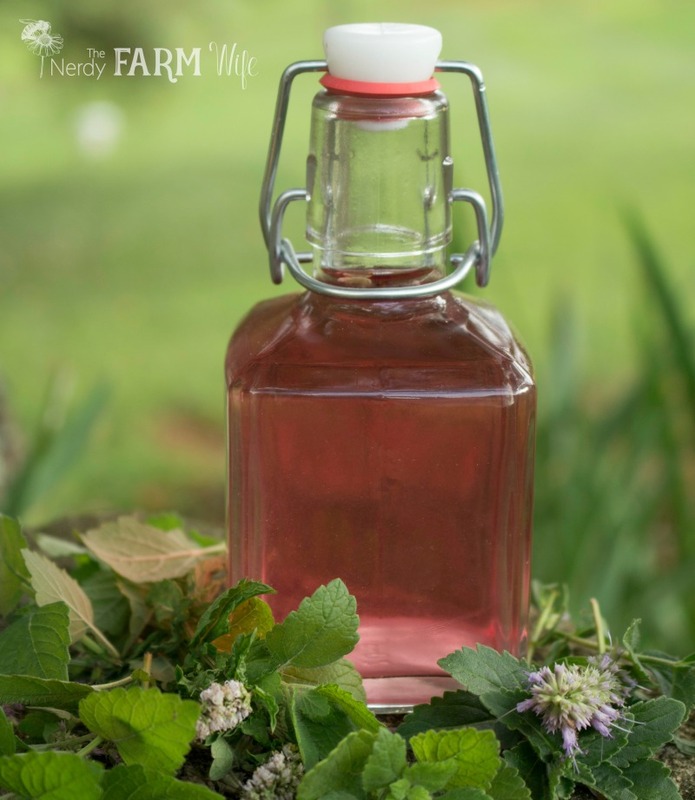 I like to use either my homemade lavender vinegar, violet vinegar or rose petal vinegar, but you can infuse your vinegar with other herbs, or just use it plain. Most people prefer apple cider vinegar for hair rinses, but white vinegar has almost essentially the same action on your hair in this case. 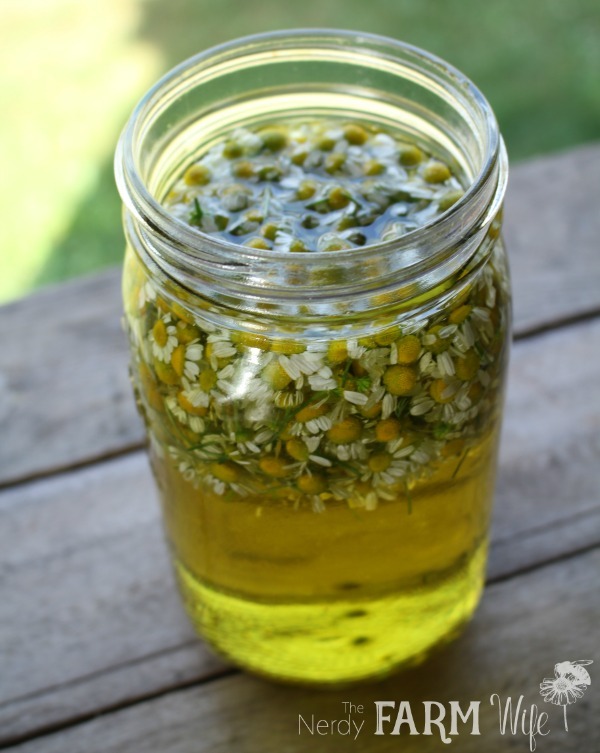 To infuse vinegar, just place flowers and/or herbs (fresh and/or dried) in the bottom of a glass, heat proof jar. Pour simmering (not boiling) vinegar into the jar to fill, then cap and let sit in a dark, coolish place for several weeks. Strain and store in the dark for a shelf life of at least a year, most likely much longer. Sunlight will make the pretty colors fade faster than just time alone, which is why a dark storage place is emphasized. This is the recipe that works best for my hubby. You can use dried or fresh herbs. 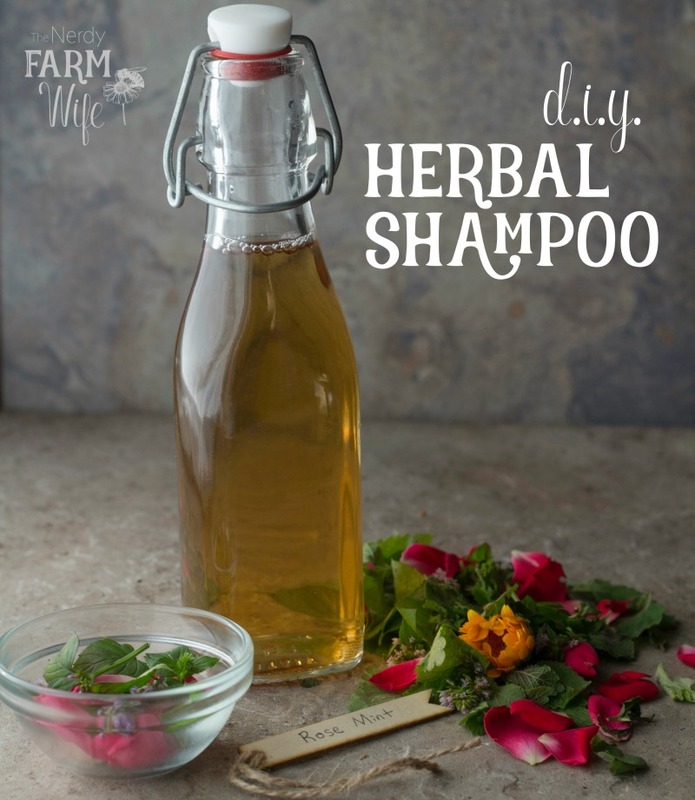 I hope this post helps to show just how easy it is to create your own herbal shampoos! You may want to use them full-time or part-time or, if you find you don’t care for it as a shampoo, you can still use it as a body wash or even a bubble bath. Have fun experimenting! 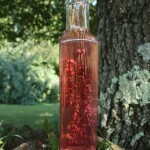 Do you enjoy making things from the flowers and herbs that grow around you? If so, I think you’ll love my book – 101 Easy Homemade Products for Your Skin, Health & Home! Tagged DIY shampoo, Homemade shampoo. Bookmark the permalink. I want to try this soon! I’ve been wanting to do something different than store bought shampoo, but don’t have the guts to do the no ‘poo method! My husband had pretty bad dandruff but has been using a almond oil/tea tree oil mix (that I use for my face) and it’s gone away! He keeps his hair short so he just wipes away the oil in the shower with washcloth. If this stops working, I’ll have to try this for him. I don’t have the guts to drop shampoo completely either! That sounds like a great method your hubby has going on – do you have a post on that or recipe to try? I’d love to try it with my son – he can never seem to remember to actually suds up when he takes a bath lol, so this sounds quick and easy to do! All I do is put 5-10 drop tea tree oil in a 2 oz dropper bottle, and fill with almond oil. Then we just use one dropper full! Super easy. Awesome – thanks! I’ll try it out on him starting tomorrow! Sweet, let me know how it goes! I want to try this over the weekend. Would I be able to pour it into a squeezable plastic bottle once it is done cooling? The glass jars are a prettier look but I feel I would drop it in the shower. I love this idea and just ordered the Dr. Bronner’s castile soap through your link. 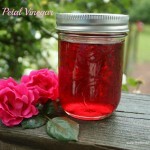 I was able to pin this through your Pinterest board, and I would also like to do a separate pin for the rose petal vinegar rinse, but I cannot find a pin button on that one and I can’t find the post for it when I search your Pinterest boards. Please help. so hopefully you can repin from that. I have been using a baking soda wahs with a vinrgar rince for over ayear now and just love it. Now I am very excited to try this. Thanks for sharing these great ideals. Please keep up the Great work! for my hair, I’ve learned to consider the type of water your house is hooked up too. Here in Seattle the water is very soft. We also use a filter on our shower head to deal with the chlorine The city puts into our water. I’ve been experimenting with using the Castile soap shampoo recipe and have also found the African Black Soap along with a vinegar rinse works wonders with my baby fine straight hair. But then we went on vacation for a week to an island in Puget Sound Washington. Our cabin had well water. I noticed it had a mineral content from the residue in the bathroom and kitchen sink. It was a disaster as far a my hair. The soap wouldn’t rinse out and the vinegar rinse made no difference. My hair was an extreme oily mess. :( had to go buy some shampoo so I looked presentable when we went out for a romantic dinner at the village restaurant. Alyse, that is an excellent point that I’ll add to my post – thanks! We have hard well water also, which is probably why I have to use the clarifying shampoo every few weeks. Jan, this is a great post! I love castile soap and use it all the time, just haven’t used it on my hair. Thanks for the link back to my site! I’ll have to link to your’s. could I use a different castile soap, rather than the mild? I have that brand but I believe I have a different scent and just wanted to be sure I could use is without hurting my hair(obviously the smell will be different)? Hi Juli, you sure can! :) You may want to use a little bit less of it, than the mild version. For the build-up, you could try washing your hair with baking soda and rinsing it with vinegar when needed. 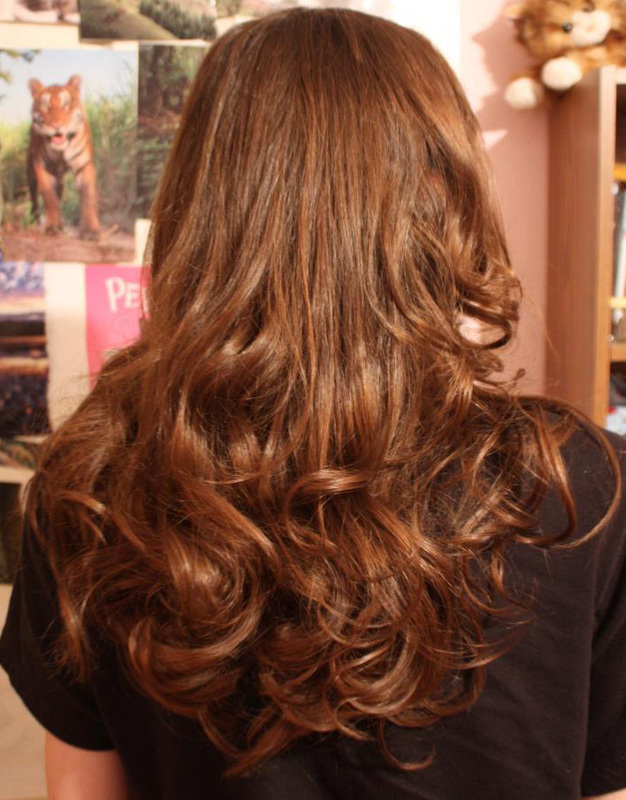 I had to do it twice, and my hair was so nice! This would completely eliminate your chemical exposure from shampoo! Yay! BTW- Thanks for posting on Eco Kids! I’m featuring this post tomorrow! Thanks Farmer Doug! I hope it helps! You might also want to check out Steff’s comment above about almond oil/tea tree oil combo her hubby uses. Sounds great! Can you buy castle soap in Australia? I love making my own products but have not tried shampoo yet! Thanks for the info on the different oils and ingredients! That looks super fun! Can’t wait to try it. Would you link this up to our blog hop?? I think our readers would love it! Hi and happy New Year! Thank you for your submission on Seasonal Celebration Wedensday at Natural Mothers Network! Your shampoo recipe is definitely one to try! Check back tomorrow when the new link-up is running to see if you are the featured post! I use my homemade goat milk soap shampoo bars with a vinegar rinse daily. My hair has never been healthier and my scalp does not itch like it used to. Great recipe for shampoo! Congrats on being featured on Wildcrafting Wednesday! Can I use this on color treated hair.? Also can I use the vinegar rinse on color treated hair? There were a lot of comments I didn’t read through, some of them might have helpful info though, if you want to scan them for alternative ideas. I’m getting all kinds of hits from you today from this post :). It’s a great post! Were you featured somewhere? Hi Char! My husband has hair on the oily side and has good luck with the rosemary formula I posted above. The thing with castile soap is that if you use too strong a concentration, it will strip your hair and then you produce more oil to compensate, making matters worse. If you try this recipe, I’d only make up a small amount to test & be sure to use the vinegar rinse. If you don’t like the results after a few times, then you might want to ask a trained professional at a salon what they would recommend for your hair type. Havent tried this yet or the vinegar rinse. But i normally need a conditioner after i shampoo to soften and detanlge my hair, will a vinegar rinse take care of that after the herbal shampoo? Hi gry, I always had to use conditioner in the past (I used organix coconut milk type), but ran out so tried going without for a while. I haven’t bought any for a few months now, so, so far so good! I’m sure though that different hair types have different needs, so you’d just have to experiment and see what your hair likes best. Hi, Jan! I’ve been using your shampoo and the vinegar rinse for the past four days. I have to shower every morning (since I have oily hair) and then blow it dry so it’s dry by the time I have to leave for work. My husband complains that blowing my hair dry makes the bathroom stink. Could I put some essential oils in the vinegar rinse maybe? Thanks for all the info! Hi! :) I’ve been reading up and using the ‘no-poo’ method with just baking soda and vinegar for a long while now. It works great, and I never have any build up or smell. One of the posts I read (Ashley’s Green Life?? can’t remember…) had a couple great tips I’ve noticed make a HUGE difference. With the baking soda, be sure to rub it in to your scalp very well, and then let it set and do the work for you during the rest of your shower, before rinsing/massaging thoroughly. This is great for no build up (along with the vinegar). Adding tea tree oil helps to not dry out your scalp. With the vinegar, Ashley suggested if you rinse VERY thoroughly, there was no longer any smell afterwards. For the first month or so of being a new vinegar user, I would gets whiffs of the vinegar here and there. It was especially noticeable after sweaty exercise, or being outdoors in the heat. Once I started rinsing extra thorough, the smell completely disappeared. My husband has commented he doesn’t smell it anymore at all. And last, I also read (and have good luck) with the “Art of hot water rinsing” hair first before applying shampoo or conditioner. This was new to me, I had never heard of it before. They explained (I forget which post it was, sorry) that your scalp produces the oils to naturally condition your hair. But who wants a greasy scalp, right? So work the water up to as hot as you can stand it, and massage down your scalp, (or brush/use wide tooth comb), to move the oils out of the hair shaft and into your hair where it’s needed. This leaves the scalp less oily, and the hair more conditioned. I do this as soon as I get in the shower as I’m wetting my hair down, then apply shampoo at a normal water temp. Thanks for sharing all of this great information! :) That’s good to know about rinsing the vinegar extra thoroughly – I hope Rebecca gets to see your followup comment to help her out and I’m sure other readers will benefit from this as well! Hair has a pH of 4 to 5.5, so to not disrupt your acid mantle (sebum production on your scalp) you should only use pH balanced shampoos. I have done a lot of research on this, I have also attended beauty school so I can say this is true. Using highly alkaline solutions on your hair (baking soda, bronners soaps, etc.) though it feels soft and manageable that is really the disulfide bonds in your internal hair structure being weakened by the alkaline solution.The colors and perms that are performed use this method to work, they “open up” your hair to deposit the color or permanent, then a clarifying shampoo is used to “close” your hair and lock the color or permanent in. To then bring your hair down to it’s proper pH a acidic solution (apple cider vinegar) when using a alkalinic cleanser is used, this is called clarifying. This dual process is not healthy for your hair or your scalp. There is a great tutorial on youtube on your hair’s pH and why this rollercoaster up and down the pH scale is highly disruptive. The maker of these tutorials is a licensed salon owner and stylist. You can check her out at KimmayTube on youtube. Or, you can ask any stylist that you know. This is why so many shampoos on the market advertise that it is pH balanced. Because that is very important. So forcing your hair to go up to an 8 or 9 and then forcing it back down to a 4.5 in a short period of time is very damaging. If you would like to keep your hair in it’s proper pH, and love making homemade beauty products, then mix 1/4 cup of coconut milk (store bought or homemade both are fine) and 3 heaping tablespoons of aloe vera gel (lily of the desert), shake well, strain through cheesecloth to remove aloe fibers, and wallah! You have pH balanced shampoo that cleanses your hair, stimulates growth of your hair, and is edible! Food for your hair! Refrigerate after use, it generally has a 1 week shelf life. You can find this recipe on youtube as well. I find that if you pour it on your scalp only, and massage and let rest till you are done with your shower, then rinse, it is magic on your hair. Just google all the benefits of aloe vera, and you will see. Then google all the benefits of coconut milk, and you will see again. This shampoo has been so amazing, I can’t ever imagine using anything else ever again. Hi Amanda, do you use a conditioner afterwards or is the shampoo conditioning enough? Amanda, I am allergic to Aloe Vera. Is straight coconut milk okay, or is there something else I should add? Can we add essential oils to the coconut milk? Do we need to use a rinse or conditioner after the wash? I have color treated hair that is curly and dry. I have very hard water that leaves my hair feeling like tangled straw after using shampoo so I have to use gobs of conditioner in order to even finger comb in the shower. My scalp also gets very itchy and even bumps from heat, sweat and possibly fungus from those. I was going to use the recipe she showed until I saw the warning for color treated hair. And use Apple Cider Vinegar and water for detangling rinse. If I use the Coconut Milk and Aloe Gel do you think I will still have a tangled mess on my head? Will the ACV rinse mess up the PH? If you use only 1/4 c coconut milk from the can and it only lasts a week, what to do with the rest of the can? I want to male several shampoos for my teens, son,daughter and hubby. My daughter came home from school on Thursday with lice. I was so pissed, since I have always helped her with her hair that’s long to her waist. We went through elementary with no problem, Technorati this new school at age 13 and gets it. I’m doing a herbal tonic with rosemary/calendula with tree oil in it. It’s working so far. I bought a baby shampoo and put 10 drops of tea tree oil. The is using that now. Finally, my question is what are your suggestions for prevention shampoo and dandruff control? Also where can I buy bulk castle soap? Any suggestions? Also wanted to do a body wash as well,this is why I ask? Thanks in advance. P.S. Don’t know if I’m subscribed. I missed some of your blogs. I think I got the gist! :) Let’s see – tea tree oil is a great preventative so I would keep that up in whatever shampoo you use. My kids were directly exposed to a child that had lice & came to our house. Our naturopath said to be generous with the tea tree oil, massaging it directly into their scalps. (I bought a bottle prediluted with a bit of carrier oil) I also used it in the laundry with hot water to wash everything. It worked for us! A trick I learned when I was a preschool teacher is to always use a vinegar rinse – supposedly it helps repel lice & dissolve the coating on any eggs. They commonly went through the school a few times a year so I caught them the first year I worked there, then the other teachers told me about the vinegar trick and I never got them again. Probably your best price to buy castile soap in bulk would be amazon.com. I think I saw in a comment here or on Facebook that Target had reasonably priced bottles as well. I made a shampoo using your recipe (didn’t use the exact same oils as you .) My hair came out oily . Now I didn’t use the vinegar rinse .Would that be the reason it came out oily ? My hair is already oily . I uses chamomile ,avocado oil , tea tree and lavender . Any suggestions ??? Hi Neely! The vinegar rinse will help, but everyone has different reactions to castile soap. My husband’s hair is oily and the shampoo leaves his clean and soft. It depends on hair length, hair type, hair health, whether you have hard or soft water (soft water will usually give better results than hard)… lots of factors. Wonder if you have video to show how to make them? For me it is easy to learn by watching it in action. Hi Shelia, I can definitely relate! I don’t have any video tutorials up yet, but that’s something I’ve been considering for the future. I make my own castile bar soap… want to try to make my own shampoo. I added oregano oil to my husband’s daily use. Combined with my homemade ginger oil, he rubs it on his head every day. His hair is growing in and filling in his bald spot and his hair is turning darker again! I like to make my shampoo with ginger and infuse it in my apple cider vinegar rinse as well. One of the best things about it (besides a smell I love) is that it gives me really pretty red highlights. I already have auburn hair, but I notice that when I spend a lot of time in the sun and use products with ginger, the red really pops. That’s great to know about ginger and red highlights! Great recipe! I made both the shampoo (lemon/lavender/tea tree w/ chamomile infusion) and the vinegar rinse (tulsi rose tea infusion) the other night. They smell terrific and work pretty well on the hair. I do have a question, though… What hair products work best with the shampoo/rinse? The first time I used the combo, I didn’t use any product, but my hair felt a little dry, so I used a curl cream (my hair is thick, coarse, and wavy; not chemically treated). Instead of acting like it normally does, the curl cream seems to have made my hair a bit greasy. I have the Earthly Bodies & Heavenly Hair book on order, so maybe I’ll find a recipe for product in there… Thanks! Hi Annie, I’m glad you liked the recipe! I don’t normally use hair products except when I use hot rollers on my hair (very rare) & then I just use a tiny dab of mouse and a spritz of hair spray. (Both happen to be Paul Mitchell products that I’ve had for ages and ages, but still seem to work ok!) I guess it would depend on hair type. Mine is thin, fine and straight so I’ve never used a curl cream so unfortunately, can’t be very helpful in comparing. The book is wonderful though! I believe she has some hot oil treatments in there you might like. She’s a fan of less shampooing overall, from what I can tell. 70 yrs ago, my mother put a bar of castile soap in a quart jar and filled it with boiling water. It ended up a jelly like consistency. With 7 in the family, I don’t know whether she refrigerated it or not. I now have white hair. If I use hot water on it, it turns yellowish so I always wash and rinse in cool/cold water. Love the idea of oregano oil and ginger oil making the color come back to his hair. My great uncle rubbed his almost bald head with salt every day, was buried at age 100 with thin black hair. My dad gets that yellowish discoloration too. He says it’s just proof he is turning blond again (he was a tow head as a kid). One thing I do know, vigorous rubbing of the scalp can help prevent/slow down hair loss because it increases blood flow to the hair folicule. I made this shampoo using Dr. Bronner’s lavender castille soap, rosemary, rose petals, and jojoba oil and it turned out brown with foam on top. It honestly looks like beer. I’m just wondering if this is normal? And if it is could I use this mixture as body wash too? You can also use 1/4 to 1/2 tsp of xanthum gum (you can find this in natural food stores or with gluten free flours) to thicken up liquid soaps. Thanks for the great tip Kate! Hi Jan, love your blog, its my first go to when I need to make something new :). Questions for you, I made a batch of this and have been very happy with it, until the last 1″ of it. For whatever reason it doesn’t foam up any more and makes my hair really oily. I shake it every time and it clearly separates into 2 parts if I don’t, but it’s been hanging around for a while. Does it loose effectiveness if it sits too long? Going to try the coconut milk / aloe one next. Oh, and I use the vinegar spray as a detangler for my daughter’s super fine long hair. Works amazing! Thank you so much for all you do!! Is it safe to use on my hair/scalp if I just was diagnosed with basal carcinoma on the very top of my head. Immediately upon finding this out I quit using chemical poos and went to organic shampoos. I would love to make my own and need and want to learn as much as I can so I can take care of myself. My Dr. removed a section on the front of my scalp but I have another coming on the crown of my head. Thank you for any insight you can give me as I would deeply appreciate any help I could receive at this time. I am determined I will beat this as I have been told how to make an ointment with garlic and olive oil after it has been infused by the phase of the new moon until the full moon. Thank you for your thoughts, comments and prayers as my heart is open to you all. God Bless. Hi Maggie! From what I’ve read, castile soap will strip hair color because of the high alkalinity – even diluted. Somewhere in these comments, someone mentioned a coconut milk shampoo that sounded nice and I’ve also heard of good results from people using honey and water as a shampoo – so, those are two options that might work. (Though I haven’t tried them myself, to give constructive feedback.) Hair types are so varied that I’ve yet to find one recipe that everyone does well with, so it takes a lot of experimenting to find that perfect one you’re happy with! 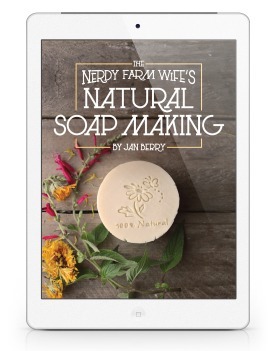 Hi Jan… i was wondering if you knew anything about using home made liquid castile soap in this recipe. 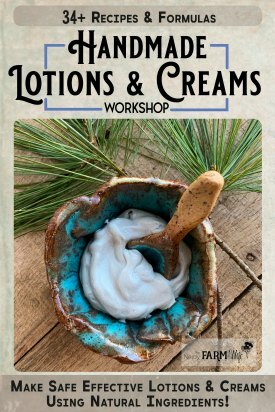 I am a soap maker and am trying to find a good recipe for shampoo. Of all of the research that I have done, I truly like your recipe and your explanation the best. I will be trying this, but wondering if any changes need to be made to the recipe. Thank you for your posts! I’ve been making gourmet, organic bar soaps for a long time now. I’ve also been making liquid soap for about a year. I’d love, LoVe, LOVE, LOOOOOVVVVE to find a shampoo recipe that won’t strip my hair of color. I’m a grandma…and I have great skin, no wrinkles…but tons of gray hair. so I color it, but then it gets stripped by the homemade shampoo. Any suggestions for me? I haven’t tried it myself, but I’ve heard some good feedback about it! Hi! I’m so glad I found this post! Does this recipe bubble or sud up well? Hi Aoi! This recipe seems really watery in your hands, but it will suds up some once it’s in your hair. If you use extra castile soap to get tons of bubbles though, you’ve usually used so much that it will be harsh on your hair. It’s sort of a fine line – you can experiment to see what ratio of soap to water that your hair type likes best. Hi Jewell, I sure haven’t, but it’s definitely worth testing a small batch to see how it goes! Any recipe for colored/highlighted hair? Hi Candy, Unfortunately, I don’t have a recipe for colored & highlighted hair. In the comments on this post, there’s mention of a homemade honey shampoo. That might be more feasible for colored hair because it should be less alkaline than this castile based one. Someone else also mentioned a coconut milk shampoo recipe that you might want to investigate as well. If I ever do find a good alternative for treated hair, I’ll be sure to share! I love the “hubby” shampoo recipe. I use lavender infused distilled water and jojoba oil and this is the best shampoo I have found. I have thick long wavy hair. I’m so glad that you like it! Going from all of the feedback I’ve gotten from this recipe – it seems that thick hair gets the best results! I did a patch of shampoo, i used only herbs infused waterb and olive oil soap, but it turned out black!!! Really black with foam on top, is that normal ?! Is it safe to be used?! Oh yikes! What brand/type of soap did you use and what herbs? It’s likely that your herbal infusion was really strong and could be watered down a bit, especially if you just made it and it smells fine, but that is an unusual outcome for sure! That sounds like an interesting shampoo recipe – thanks for sharing! Can you add aloe vera to this shampoo mix? I have fly away hair that is a bit dry. How much would I add? Hi Nicky, That sounds like a great idea! I haven’t tried it before, so am not sure either. You could try a small spoonful in a test batch and see how you like it! Hi Everley, That’s no problem at all – I’m glad you like the recipe! PS: My artsy daughter & I are having fun looking at your site. Love the projects & your talent! I am wanting to make goat milk shampoo.. My question is can I just substitute milk for water in recipies as long as I use a stabilizer? I haven’t tried your recipes, but I have tried making a couple of my own. I decided to get away from the chemical laden shampoos and conditioners because my hair was falling out in handfuls! Since switching to the homemade hair care products, my bathroom is no longer covered with my hair and i don’t look so bald. I looked like I was going bald :( I have only been doing this for 2 1/2 weeks and I can’t believe the difference! My only regret is that I didn’t take a before picture of my head to show the dramatic improvement. I am hoping I will see new growth. I am so happy I went all natural! These are lovely ideas, & I hope to try a variation soon. Question: I would like to make a shampoo without detergent, a cleansing conditioner. Everything I’m finding includes soap. Do you make cleansing conditioner recipes without soap? I have not tried the baby mild Castle–it may be mild enough. Thank you! & God bless you & your family. Hi Andrea! The baby castile was milder and worked better than regular liquid castile soap, however, after many months of use, I still found that castile based soaps lead to buildup. I’m much happier with shampoo bars these days and plan to update this post very soon to reflect my change of view on homemade shampoos. It’s a tricky thing, since there are so many different hair types combined with differing variations of water hardness, and no one recipe seems to suit everyone. I haven’t found a good cleansing conditioner recipe (yet), but I hope that you’re able to find just the right thing for you! Hello! This recipe seems fantastic! I have one question though- what if you use henna to dye your hair? Will the shampoo still strip the color? I only ask because you say that this shampoo will strip hair dye but henna isn’t as chemical-ly as regular dye. The other day I tried the Dr Bronner’s baby unscented soap. I used 1/4 cup of soap 1/4 cup of distilled water 10 drops of tea tree oil 10 drops of rosemary oil and 10 drops of lavender oil. I loved the recipe but it seem like my hair was breaking off very easily from root. What did I do wrong?? Hi Yese! Some people’s hair just doesn’t do well with castile soap. If your hair is breaking easily, then it sounds like it’s not the shampoo for you. You can still use it as a body wash though! Hi Lisa, You sure can! I like NataPres because it’s nature-derived & it has passed all of my challenge tests so far, but there’s a whole load of them to choose from at Lotion Crafter. I love this herbal shampoo. It’s very sudsy and my hair looks and feels awesome every time. Since making DIY shampoo for a few years mostly using an Avocado Pit shampoo (absolutely no suds), this recipe is far more satisfying to use and to make. Thanks a million for posting! Hi IsabelRose, That’s wonderful to hear! I’m happy that you like it!